the first time, Jami recounts her gripping story of being trapped in the snow for eleven endless days, the grievous loss of her legs, and the fortitude it has taken to not only walk again but run like the wind -- all the way to freedom. On December 23, 1987, nineteen-year-old Jami Goldman and her friend Lisa Barzano headed home from a ski trip in Purgatory, Colorado, never imagining they would end up in a freezing hell on a back road that the state of Arizona had closed without checking for travelers in distress. The girls' car battery died during that first long night, stranding them in below-zero temperatures. With only a cinnamon roll and a six-pack of frozen Diet Pepsi, the next ten days became an exercise in survival, testing their faith and courage even after they were rescued -- when Jami's legs and feet were deemed beyond saving. Wise, forthright, and astonishing, Up and Running follows Jami's global journey from loss to recovery. Her story, which often reads like a compelling mystery, features her supportive family and friends, a devastating court case, her passionate relationship with the man she married, and finally, her triumph over inconceivably fearful obstacles. 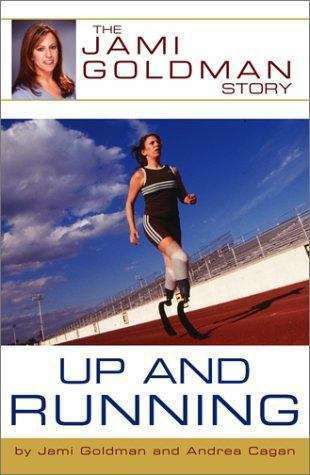 In the end, Up and Running shows us all how to use adversity as a stepping-stone -- leading us to heights we previously considered out of reach and beyond our wildest dreams.